Getting Fair Payment for a Pedestrian Accident in Florida | DeLoach, Hofstra & Cavonis, P.A. How can I pay my medical bills after a pedestrian accident? When two cars collide, the victims have the benefit of airbags, steel frames, and countless safety measures to protect them from harm. People who are struck while walking or cycling have no such protection, causing injuries to be much more severe. Pedestrians involved in vehicle accidents are usually sent to the emergency room, may have a lengthy hospitalization, and are out of work for weeks, or even months, all of which, can be extremely costly. Pedestrians and bicyclists are often struck when vehicles turn in front of them, wander into pedestrian paths, or in a moment where the driver’s attention wasn't on the road. In just a few seconds, a pedestrian can suffer severe disability or even death as a result of being struck by a car or hitting the pavement at a high speed. Head injuries. A pedestrian will usually suffer traumatic brain injury (TBI) as his or her head makes contact with the hood of a car or the road surface. Even if a bicyclist is wearing a helmet, he or she can still suffer concussions or brain bleeding that results in long-term brain damage. Chest and abdominal trauma. The force of impact can break a pedestrian’s bones, causing fractured ribs, a broken pelvis, and internal bleeding. Spinal injuries. Bicyclists and pedestrians often suffer back injuries, such as a herniated disc or a spinal fracture that results in temporary or permanent paralysis. Injuries to the extremities. In addition to internal injury, pedestrians may suffer broken hands, feet, and fingers as they attempt to brace their falls—or road rash and broken noses if they're unsuccessful. Death. An impact at high speed can easily cause loss of life for a pedestrian or cyclist, placing an enormous financial and emotional burden on surviving family members. The pedestrian’s car insurance. Florida is a no-fault insurance state, meaning each driver is expected to cover the costs of his or her own injuries after a car accident. All drivers are required to purchase personal injury protection (PIP) insurance to cover any injuries caused by car accidents. If the injured pedestrian or bicyclist also owns a motor vehicle that's insured in the State of Florida, the victim can use his PIP car insurance coverage to pay for his injuries, even if his vehicle wasn't involved in the accident. If the injured pedestrian doesn't own a vehicle, he or she can be covered under the insurance policy of a relative living in the same household that owns an insured vehicle. The driver’s car insurance. 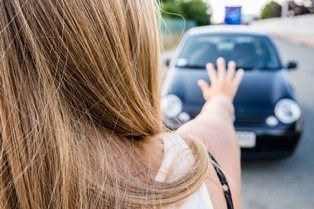 If the injured pedestrian doesn't own a car and doesn't live with someone who owns a car, he or she can get payment under the insurance of the at-fault driver. This coverage provides medical, surgical, disability insurance, and funeral benefits to the driver and to other persons struck by an insured vehicle. In general, PIP providers are required to pay 80 percent of medical bills and up to 60 percent of lost wages directly caused by the effects of the crash up to a limit of $10,000. The pedestrian’s health or disability insurance. Although PIP insurance can pay for a significant amount of a person’s injuries, it's often not enough to cover the full effects of a pedestrian accident. A victim may have to file a claim under his a health insurance or apply for disability benefits if he's unable to work or needs ongoing medical care due to the crash. A personal injury lawsuit. Many people who are struck while walking or cycling don't have enough insurance coverage to pay for the extent of the treatment they'll need to recover from their injuries. Some won't ever be able to function at the same level as before the accident, and may not ever be able to earn a living to support themselves or their families. In these cases, victims would be best served by speaking to an accident attorney about their case. A personal injury case may be the best way to recover lost income, ensure that future health costs are paid for, and to hold the driver accountable for pain and suffering. If you or someone you love has been involved in a car-pedestrian accident, our aggressive legal team can take over your case while take the time you need to heal from your injuries. Simply fill out the form on this page today to make an appointment in our offices.